I was not an athletic youth. Skinny. Uncoordinated. Bad eyesight. One of my grand moments of athletic triumph occurred playing backyard football. After many failed attempts to catch a pass, finally one stuck in my hands! In all the excitement of having not dropped the ball, I had to be reminded – encouraged – to now run with it! So, I came to Ultimate a bit late in life. We played “frisbee football” from time to time in middle school physical education class and I always loved hanging around and throwing a frisbee. But it wasn’t until graduate school in Tuscaloosa that I really started to play Ultimate. On my first forays with the University team, I could barely breathe and didn’t stick with it. I blamed the freshly cut grass at the time, but it had to be the cigarettes (and the cut grass, of course). There were a few other small groups that played from time to time and I cut my teeth with them. It was with WWF in Washington DC that I really got to play. My boss at the time seemed to use Ultimate as a criterion for weeding out all the over-educated geeks that sent piles of resumes from Ivy League schools. So I found myself in a working environment that expected 70 hours a week, had tequila shots after 5 pm, and played Ultimate during lunch every Tuesday and Thursday and joined the Washington corporate league every summer. 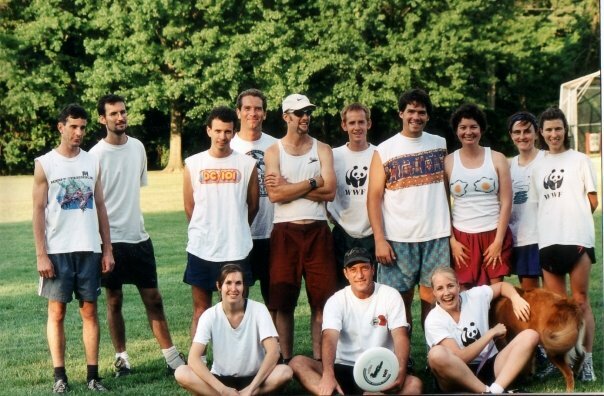 Biodiversity Support Program corporate Ultimate team circa 2000. Back row (l to r) John Morrison, Tom Alnutt, Ken Kassem, Don Anderson, Vance Russel, Colby Loucks, Wes Wettengel, Karen, ?? ?, Emma Underwood. Front row: ?? ?, Dave Olson, ??? But I never got the chance to play at a really high, or even moderately high, level. So, when I realized in 2012 that the World Flying Disc Federation World Ultimate and Guts Championships were going to be held in Sakai, Japan and that it was not far from Kyoto, I was desperate to get a chance to take part. Through diligent stalking of the organizers, I got a chance to volunteer as an official to help run the tournament. The tournament featured two sports – Ultimate and Guts – but the emphasis was clearly on Ultimate. I didn’t see a single minute of a Guts game. Never even knew where they were held. So, for a full week there was a full course of Ultimate every day in categories including Open (Men), Womens, Mixed, and Masters (both Men and Women). The venue was one of the Japanese national soccer training facilities and had 5 -6 beautiful natural fields and more artificial turf fields. The contingent of 30 volunteers were assigned to games throughout the week to serve as scorekeepers, timekeepers, and general observers. True to the spirit of Ultimate, there were no referees as the players are supposed to act as their own referees on the field. Sakai is an industrial suburb of Osaka. As part of the adventure I decided to cycle from Kyoto, through Osaka and into Sakai and booked a hotel about 15 km from the venue. The ride from Kyoto to Osaka followed the river and was lovely but cloudy and a bit drizzly. The rain really started to fall as I reached Osaka and started to navigate my way through Japan’s second biggest city – luckily its easy to get around. Sakai, besides having some interesting archeological sites, is an industrial coastal area with huge areas of reclaimed land and massive factories and warehouses along the waterfront – with the soccer facility nested behind a massive Amazon.com warehouse. It was lots of fun to ride through the contrast of Kyoto’s history, the developed but clean river, the mega city and the industrial waterfront. The tournament itself was great! I was on the sidelines for some of the best Ultimate in the world for a week. I got to officiate the women’s final and the men’s semi-final, but I didn’t get to watch the final as I had to cycle back to Kyoto before dark. My favorite moment was meeting a woman who played on the USA Women’s Master team. She was upset that she didn’t get much playing time as she was the oldest women on her team – at 34! I knew then that my competitive playing days were over! But I made some friends, learned how to count in Japanese and really enjoyed by week. The full results are listed here, but for me the week was about the great tournament and not about who won or lost. This entry was posted in Flying Discs and tagged Osaka, Sakai, Ultimate, WFDF. Bookmark the permalink. Love it, Ken. And now may I introduce you to the true meaning of life: tennis!